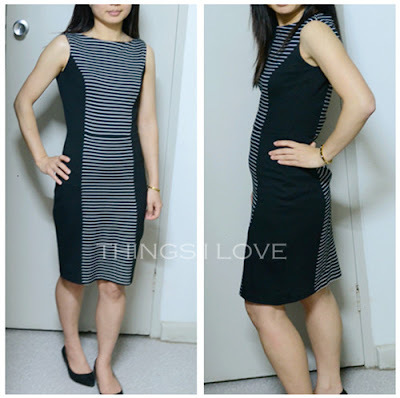 Things I Love: Win Your own Secret Sculpt Dress! Now that winter's finally passed and we are heading to the warmer month, we are shedding our layers of clothes, and putting on dresses and light jackets. This is the time that I love wearing dresses to work as I find it looks professional and feminine all at once. Alas, too much indulgence in the food and drinks department over the winter period have me developing a little belly and feeling rather unfit. So whilst I work on getting a consistent exercise regime and eating more healthier meals, I now have another secret weapon to achieve instant results (even if it's only momentarily). You might be surprise to hear the secret come from Target as they have just launched a line of stylish body sculpting dresses that flatters any body shape, a claim sounding too good to be true. They've used the latest stretch knit fabrics that gives a svelte outline that is comfortable all day and an elastine based lining to create a toned body look by helping to support and tuck all the the problem areas of our body like the stomach, hips and thighs. When wore the secret sculpt dress, I looked like I have washboard abs again - just look at how flat that stomach is! These Secret sculpt dresses come in a variety of other styles, a polka-dot one, a classic black one and a black & a peplum version and a white with a ruched or twisted waist to further hide the problem areas. The dress can be transformed from day to night wear with some snazzy pairing up of cute or elegant accessory accents and pair of heels. These gorgeous dresses are available now at Target stores or online for an affordable price of A$59 each in sizes 8 to 20 so everyone can find the perfect fit. And I have some great news - Target is sponsoring the giveaway of a $50 gift voucher for Things I Love readers to pick up one of these dresses to try them self ( although you will have to part with a small change of A$9 to buy the dress)! Here are 2 ways you can enter. No Facebook? Then you if subscribe to TIL via email or Bloglovin and comment below with your Facebook name and which Secret Sculpt dress you would like to get, you'll also be able to enter. One person per entry. The giveaway will close till midnight 15th September and I'll be drawing out the winner via a random number generator from the valid entries. Of course, the competition is for Australian residents given they will need to go to Target Australia to spend the gift voucher. I like the classic black one. I'm really interested to try these sculpt dresses to see what difference they make. I also think the polka dot one is cute as. i would love the classic black. I would definitely want to see if it makes a big impact. I love the panelled one - always a flattering effect! I love the Black and White Stripe - it's so flattering and I'm sure it'd hide my jiggly bits! Have liked you on FB (Stacey Shailer). The classic black one. You can't go wrong with black! The polka-dot one because it's cute and classy at the same time. If I am lucky enough to win I would love to buy polka-dot sculpt dress..
Would love the black and white stripe dress, looks so gorgeous on you! I'd go for the basic Black dress... the combination of body sculpting and "black makes you look thinner" should be unbeatable!